This ride has some excitement, with the upside down turns and drops it could be tons better if it had a longer duration. A sad note, this will most likely be the last season for this amusement ride. Rumors abound of plans to replace it. If so I can hardly wait to find out what Knoble has up his sleeve as a replacement. I do think this ride has seen better days but I also didnt think it was quite as bad as some of you guys think. It wasnt as rough as other Arrows Ive ridden. I didnt like that weird, painful drop off at the top of the lift hill and the very short length. Original layout and good landscaping though. I really didnt think this ride was that bad. I loved the headchoppers from the trees and supports and was amazed with how compact this coaster is. My only problem with it is all those right turns. Not even in the same league as the other coasters in the park. Too short...too rough, and the oddest sounding lift. 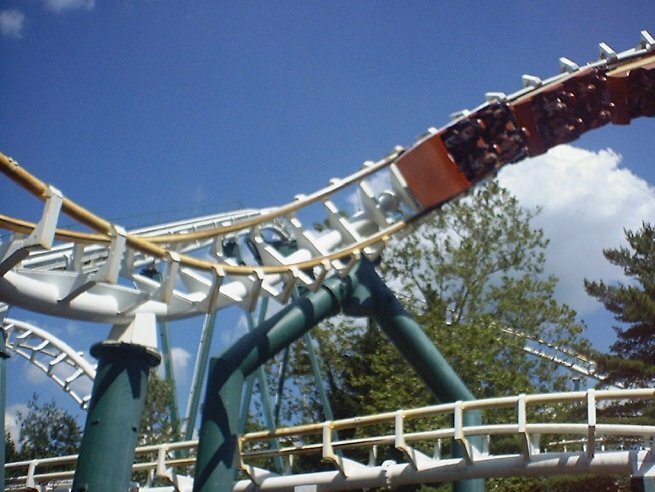 I usually dont complain about the pain from roller coaster but this one is right there with Viper (SFGAdv). This was the only bad ride I encountered in the park. 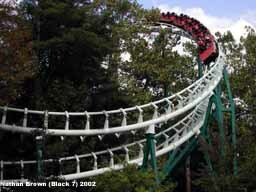 Edit on 11/15/04: Boat Tag is another bad ride I encountered, otherwise Knoebels rocks! Absolutely the worst coaster I have ever rode. Nothing is good about this ride and that is hard for me too say, because I love going to Knoebels. It is painful, ugly, slow and boring. I cant believe i spent money on this that I could have used on the Phoenix or birch beer. You just have to ride it once to see how rotten it is. Man just writing this review refreshes my memeory of that horrid 50 seconds. Oh have I said its bad. My first upsidedown and steel coaster, so it has a special place in my brain, but it hurts sooooooo much, especially at the inversions. absolutely hated this ride. Wayyy too short, EXTREMELY bumpy everywhere, and not intense at all. The best part is when you hit the break run and yell "yay! its over! An okay to good coaster. The corkscrews are the best part. My first steel coaster. Its ok for somebodys first ride on a coaster. Other than its way too short, kinda slow, and sort of boring. One good thing is sometimes they will give you two rides. It really wouldnt be a bad idea just replacing this coaster with something bigger.